Dear Friends of the BCAA! Thank you for stopping by our booth and participating in our 2018 Burlington County Animal Alliance “Pet Alumni Reunion” Fund Raiser. I was very pleased that so many people stopped by to help support the Burlington County Animal Alliance. Thanks to you and your support, $520 was raised from your donations and to show my gratitude and my continued commitment to the communities that we serve, I will be matching and adding an addition $520… so more than $1040 was raised in just 2 hours! The pictures from the Saturday 22, 2018 fund raiser are now available for viewing on line. As part of your donation and as an additional small gift from my family to yours, you may download as many pictures as you like, as many times as you like. 4. Click on Jacki Smoyer… The Smart Move ! 5. Find your favorite pictures. 7. Save or Print! Repeat! On behalf of my husband Stan and our son Trey and all the dedicated volunteers of the BCAA, thank you once again for your generous support to this great organization. September 8, 2018.Mount Laurel, NJ- A Personal Pet Photo Session and a “ 2018 BCAA Pet & Family Alumni” Reunion Group Photo opp event sponsored by Mount Laurel and Marlton Award winning Real Estate Agent Jacki Smoyer from The SmartMove.com will benefit The Burlington County Animal Alliance ( BCAA) on September 22, 2018 at Mount Laurel Day at the beautiful Laurel Acres, Church Road, Mount Laurel, NJ, from 11-2. Stop by TheSmartMove.com booth for your personal “Pet Photo Session” by renown professional Pet Photographer David Jackson of DJimages.biz. For just a $10.00 donation, you can have a professional portrait taken of your favorite pet… a great family, holiday gift or holiday card idea. In addition, Smoyer will match the first $1,000 in donations. “We are so happy to be partnering with Jacki Smoyer of TheSmartMove.com. She is a true pet lover and we are so grateful to her for putting together and sponsoring this alumni event to benefit The Burlington County Animal Alliance,” said Debbie Hampton, BCAA Director of Development. “We are inviting all of our families that have adopted pets from the BCCA to stop by and participate in our official “ 2018 BCAA Family Alumni Group Picture” that will take place at the booth at 1.30,” concluded Hampton. The group picture will be free and available for download to all, compliments of Jacki Smoyer. “ We have always been great dog lovers and I wanted to do something that would help protect so many wonderful animals and help them find loving homes” said Jacki Smoyer, Mount Laurel and Marlton award winning sales associate for Weichert Realtors. “Regardless of whether our economy is up or down, abandoned and lost pets who have found their way to the Burlington County Animal Alliance need the continued generosity of donors and volunteers for food, shelter and to help them find their “ Forever Home!,” continued Smoyer. “I encourage everyone to support this amazing organization by stopping by our booth on September 22 at Mount Laurel Day,” concluded Smoyer. 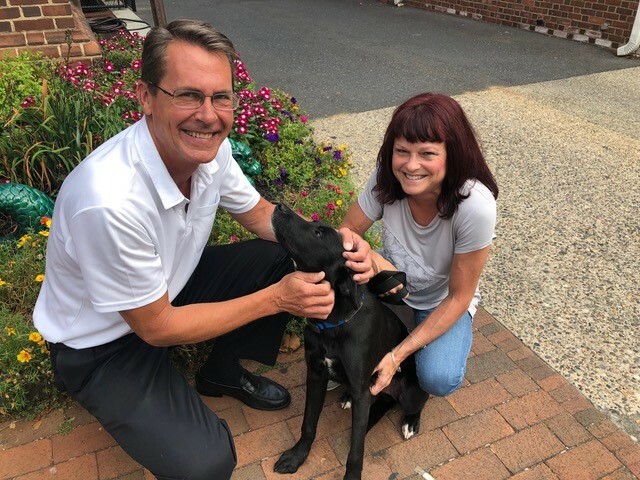 L-R Stan Smoyer, Weichert Reality, TheSmartMove.com, Glenn Deaton, A BCAA recently adopted “ New Best Friend” and Debbie Hampton, Director of Development for the Burlington County Animal Alliance, are pictured here as they help “ Glenn” get ready for his big photo opp on September 22 at the 2018 Mount Laurel Fall Festival.